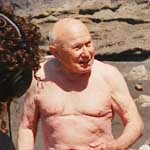 John H. "Doc" Ball, at age 94, was the oldest living American surfer when he passed away in December of 2001. Throughout his final years, he continued to skateboard and surf without a wetsuit in Shelter Cove in Northern California. Doc had been riding waves since 1929 and wrote the classic photo book about early California surfing, CALIFORNIA SURFRIDERS (1946). A dentist and perhaps the best-known surf photographer who ever lived, he captured more classic surf images from the 1930s through the '50s than any other photographer. He co-founded the State's first surf club in Palos Verdes, was a great storyteller, a legend among surfers (and surf photographers) and a warm and generous spirit, who remained "stoked" about life until his final days. In addition to loving the ocean's waves, he loved the camaraderie of surfing, beachcombing and gathering driftwood to carve. His woodcarving speciality was eagles. As the partriarch of American surfers, he opens and closes SURFING FOR LIFE. His ashes were spread at sea in dual memorials at both Shelter Cove and Palos Verdes Cove. Doc is survived by his wife, Evelyn and son Norm. 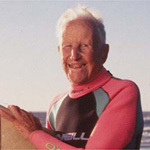 LeRoy "Granny" Grannis, 83 and a surfer for 67 years, was Doc Ball's best friend for over 70 years. He has excelled at several professions--military pilot, phone company executive, photographer--and has raised four children. Like his old friend Doc, Granny has shot countless classic surfing photos from the 1950s to the present. The founding photographer of SURFING Magazine, he began hang-gliding in his 50s and sailboarding in his 60s. His recent surf photography book PHOTO: GRANNIS, profiles "surfing's golden age, 1960-69" and has received great acclaim. Photos by Doc and Granny (and the work of many other surf photographers) help to illustrate the life histories of several of the subjects and pioneering surfing communities in Surfing for Life. Granny and his older surfing friends spread half of Doc's ashes in the Palos Verdes Cove memorial to Doc. 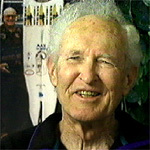 Woody Brown is 91 and lives in Maui, Hawai'i where he surfs every chance he gets. He became a national flying hero in the '30s, setting world gliding records in both altitude and distance, a Hawaiian big wave surf hero in the '40s and--after inventing the modern catamaran--a yachting world celebrity in the '50s. Woody's great stories are illustrated by several of the classic photos and film footage of him surfing huge Hawaiian waves in the '40s and '50s. 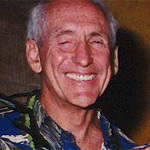 His sequence as a volunteer at an Adult Day Health Center in Maui where he is "working with love" clearly reveals Woody's extraordinary compassion, charm and humor. In collaboration with his daughter, Mary Sue Gammon, Woody is close to completing his third book, on the "Gospel of Love." Anona Napoleon, a 60-year-old native Hawaiian, has surfed for 50 years. She was a championship surfer and kayaker in the late '50s and '60s, winning the prestigious Makaha International Surfing Championship in 1961. This victory followed a miraculous recovery from a paralyzing accident at Waimea Falls only a year earlier. A warm and gracious example of Hawaii's "Aloha spirit," she was a college humanities lecturer who decided in the late 1990s to return to graduate school to pursue a Ph.D. in Education at the University of Hawai'i. Her focus is Culturally Responsive Curricula and specifically Ho'oponopono, the Art of Peacemaking. She has five sons and twelve grandchildren who surf--often together. Her family's "Napoleon's Holiday," when the full extended family skips school and work to spend the day together surfing, is a high point of SURFING FOR LIFE. 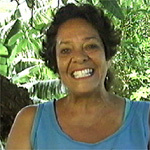 Her husband, Nappy, is a world-class championship outrigger canoe paddler and steersman. Fred Van Dyke, 73, is a teacher, author and pioneer of big wave surfing. He moved from California to Hawai'i in the '50s to surf the big waves, taught with his friend Peter Cole at the prestigious Punahou School, and wrote the classic surfing book Thirty Years of Surfing the World's Biggest Waves. A physical fitness enthusiast, Fred still surfs the 10-footers regularly and gives multi-media presentations on healthy aging and surfing throughout the country. The emotional center of SURFING FOR LIFE is his recent painful decision to confront his fear and give up surfing the huge waves with which he had become so identified. Fred is the author of three other books that are currently available: ONCE UPON A WILDERNESS, TWO SURF STORIES FOR CHILDREN (Age 6 to 106), and ONCE UPON ABUNDANCE (A COMING OF AGE IN CALIFORNIA AND HAWAI'I). 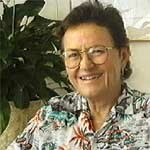 His wife, Joan Marie Florence, was the principal factor in his decision to quit surfing big waves. 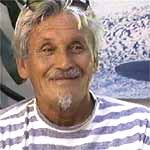 Rabbit Kekai is 81 and a legendary Hawaiian beach boy, waterman and world-class big wave surfer. He began surfing at age five in 1925, became the first practitioner of "hot-dog surfing" and nose-riding in the late 1930s, then became a top beach boy to the stars in the '40s, '50s and '60s. Winner of countless international surfing contests, he is still a world-class competitive surfer, story-teller and a gracious embodiment of the Aloha Spirit. He is often considered the principal protege of Duke Kahanamoku, the "Ambassador of Hawaiian Surfing and of the Aloha Spirit." Rabbit recalls that whenever he's a bit stressed, his eyes still "light up" when his wife, Lynn, says, "Go surfing." Shay Bintliff, M.D., 66, is an emergency room physician, mother of two and surfer for over 35 years. She has travelled the world, studied with Meher Baba in India and performed stand-up comedy in clubs and on cableTV comedy specials. When the surf was good, she recalls leaving word with her secretary that she was off to a "board meeting." Extremely energetic and affable, she embraces life, love, nature, and the challenges of aging in her wise and witty observation that "change is inevitable; it's the growth that optional." Her stories about peak experiences and family, especially about holding hands while surfing with her two sons ("electricity passes between us"), are high points of the documentary. 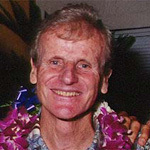 John Kelly, 82, is a renowned pioneer of Hawai'i big-wave surfing and one of the first surf board designers. A war hero, musician, conductor and dedicated political activist, he founded the seminal environmental organization "Save Our Surf" in 1965 which has opposed environmental threats to Hawaii's coastal zone and blocked over 30 proposed developments. His sequence recounting the Pearl Harbor attack and its aftermath -- when his Navy job forced him to place dead American and Japanese soldiers face to face in the same coffin, an experience which transformed him into a life-long activist -- is a high point of the film. John's "Hot Curl" board, created after he took the ax to his surfboard's tail, revolutionized surfboard design in the late 1930s. Peter Cole, 72, is another famous big wave surfer who has been surfing for nearly sixty years. He graduated from Stanford where he was an All-American swimmer, followed his friend Fred Van Dyke to Hawai'i, taught at Punahou and is now a supervising computer specialist at the Pacific Command Headquarters staff at Camp H.M. Smith Honolulu. 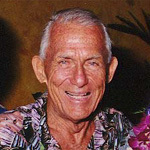 During his first year in Hawai'i he won the 1958 Makaha International Surfing Contest, the biggest contest worldwide at the time. Peter is now the Chair of the Oahu Chapter of the Surfrider Foundation, an environmental organization working to preserve surf sites worldwide. Like his friend Fred Van Dyke, Peter is extremely fit and continues to be a world-class gentleman and surfer. Unlike Fred, though, Peter continues to surf the giant waves on the North Shore of Oahu, the oldest surfer to do so. One of the most memorable scenes in SURFING FOR LIFE captures Fred and Peter playfully debating whether they skipped mandatory meetings at Punahou School when the surf was up. 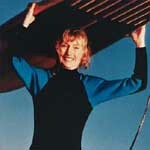 Eve Fletcher, at 75 is one of the oldest women still surfing. A surfer for 45 years, she had a successful career as an animation supervisor for Disney Studios where she worked on SLEEPING BEAUTY, CINDERELLA and hundreds of other films. She is an avid gardener who still surfs regularly with several surfers over 70 at San Onofre, the home of more surfers over 70 than any other beach in the world. A high point of the film is classic 1958 footage (shot by "father of the surf film," Bud Browne) of Eve and her friend Marge "on surfin' safari" in Hawaii where she became friends with Rabbit Kakai and lived in Fred Van Dyke's van which she bought for $75 (and then, reportedly, re-sold to him for $100). The film is narrated by actor Beau Bridges.